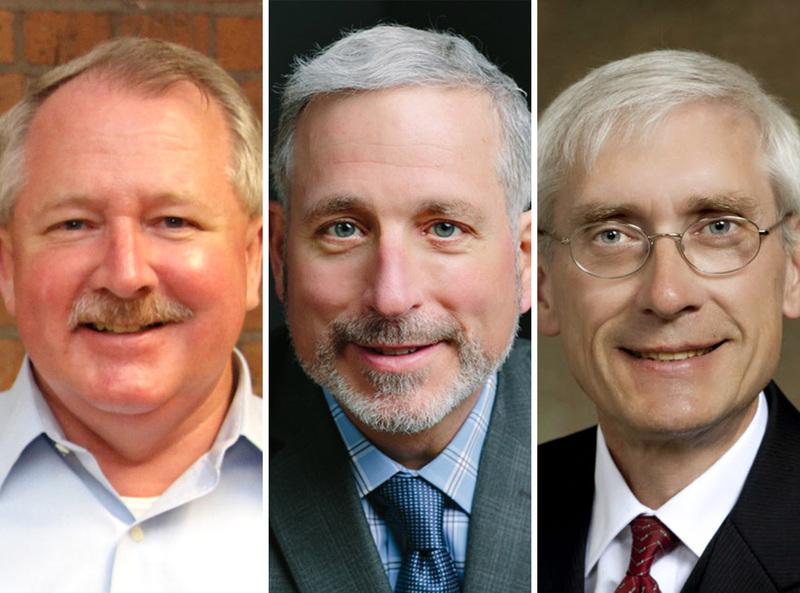 By Tom Kertscher on Tuesday, September 12th, 2017 at 2:54 p.m.
Three leading Democratic candidates for governor have criticized Walker for the deal he is pitching for a Foxconn manufacturing plant. From left, state Rep. Dana Wachs, businessman Andy Gronik, state schools superintendent Tony Evers. A contract between the State of Wisconsin and Foxconn, the Taiwanese high-tech manufacturer, is expected to be signed by the board of the state Economic Development Corp. on Nov. 8, 2017. Foxconn plans to invest as much as $10 billion in Racine County for a plant that would manufacture liquid crystal displays and employ up to 13,000 people. In exchange, the state has agreed to give the company up to $2.85 billion in cash payments and $150 million in tax breaks. 1. The state’s $3 billion offer, which includes up to $2.85 billion in cash incentives, would be the highest subsidy offered by a state to a foreign company, according to a research group. The fact check: One Wisconsin Now, a liberal advocacy group, says Wisconsin's $3 billion incentive offer to Foxconn is "the largest gift ever by a state to a foreign company." The $3 billion wouldn’t be given -- it would be paid, in increments, based on how much Foxconn spends on capital investments and payroll. But the only compilation of government subsidies we found shows that the Foxconn offer would exceed the highest subsidy provided to a foreign company -- $1.65 billion in 2012, made by Pennsylvania to Dutch Royal Shell, based in The Netherlands. 2. 13,000 jobs is only a possibility. The fact check: Walker says "Foxconn is bringing 13,000 high-tech jobs to Wisconsin." Leaving aside the term "high-tech," Foxconn is a long way from even breaking ground on a plant that was only announced the same day Walker made his statement. And the company itself has been more measured, saying the planned plant initially will create 3,000 jobs, "with the potential to grow to 13,000 new jobs." But the 13,000 is more than talk. Foxconn is pledging a $10 billion investment and the state is offering the $3 billion, with $1.5 billion aimed at the creation of 13,000 jobs. 3. The $3 billion offer isn’t a flat-out guarantee, but Foxconn isn’t offering any jobs guarantees, either. The fact check: Democratic gubernatorial candidate Andy Gronik says Wisconsin is "guaranteeing Foxconn almost $3 billion, but Foxconn is not contractually guaranteeing how many full-time employees it will hire, for how long and at what pay." Wisconsin is guaranteeing to pay cash to Foxconn of up to $2.85 billion -- but the full amount would be paid only if the company invests at least $9 billion in its plant and, in rough numbers, employs at least 13,000 people earning at least $30,000 per year. The payments would be less if Foxconn doesn’t meet those targets. It’s true that Foxconn is not guaranteeing how many people it will hire, for how long and at what pay. That means it’s theoretically possible the company could earn up to $1.35 billion in investment incentives but not employ anyone, if it built the facility but never operated it. But the other $1.5 billion would be paid, on a graduated basis, only as people are employed at the plant. 4. The $3 billion wouldn’t equate to $1 million per job. The fact check: State Rep. Melissa Sargent, D-Madison, said in a tweet that "3,000 jobs cost #WI taxpayers more than $3 billion in tax giveaways. Break it down: more than $1 million in taxpayer dollars per job." The per-job cost could never reach $1 million if only 3,000 jobs are created; the full $3 billion would be paid only if 13,000 jobs are created. 5. But it’s possible a lower incentives payment could equal $1 million per job. The fact check: State Senate Minority Leader Jennifer Shilling, D-La Crosse, said: "Foxconn tax break could exceed $1 million per job." If Foxconn invests at least $9 billion in its plant as it has said it will -- but hires only 1,500 workers, not the 13,000 it says there are potential for -- the incentives paid would exceed $1 million per job. That being said, while there is not a commitment that Foxconn will create a minimum number of jobs, there is also no evidence that the total would be only 1,500 jobs if it invests $9 billion in its plant. 6. The incentives offer isn’t based on only revenue the state would get from Foxconn. The fact check: One Wisconsin Now said Walker "wants state taxpayers to dole out up to $250 million annually in incentives" to Foxconn "to lure a manufacturing plant to Wisconsin that he claims will generate $181 million in tax revenue." Walker does want to offer $200 million to $250 million per year over 15 years in incentives in order to get Foxconn to put its plant in Wisconsin, and the estimate is that the project will produce $181 million per year in tax revenue. But what’s left out of the statement is that Walker and others are pursuing the deal in large part because the massive development is expected to generate other new businesses, new housing and other economic activity that will, in turn, produce even more tax revenue. 7. Foxconn did not follow through on its announced plans to build a manufacturing plant in Pennsylvania, and it wasn’t simply because Pennsylvania "changed governors." The fact check: Walker said Foxconn didn't keep a promise to build a plant in Pennsylvania because "Pennsylvania changed governors." The record indicates that by the time a Democratic administration took over, little progress had been made more than a year after Foxconn and the previous governor, a Republican, announced Foxconn’s plans. It's not as though there was a deal in place that fell apart after the election. Foxconn, meanwhile, has given explanations ranging from "material changes to the business and operating climate at that time," to Pennsylvania not making an economically viable to proposal to, reportedly, blaming Pennsylvania’s change in governors.